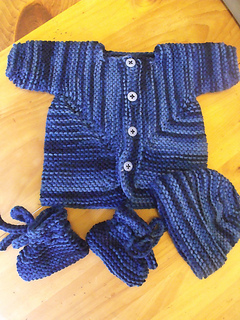 This is a pattern I wrote that adapted EZ’s baby surprise jacket to fit a 3 to 5 lb preemie, roughly 11” finished chest, using sports weight wool at 6 sts to the inch. 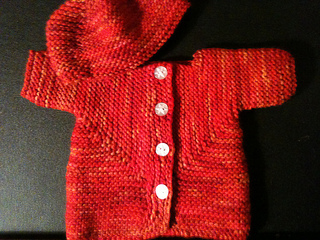 Using worsted weight, it is a newborn sized sweater. The sweater starts from sleeve extensions, since I like longer sleeves; after that, everything sails along like the BSJ. 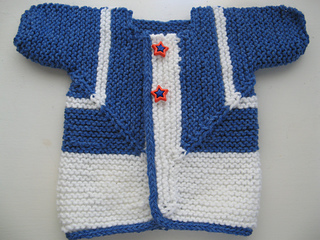 It was published on my blog with permission from Meg Swanson, who now owns the copyright for the BSJ pattern. 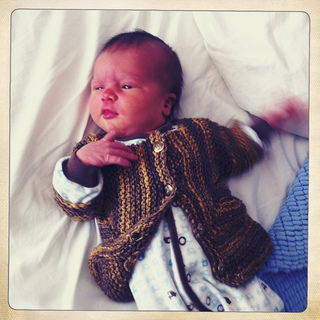 My preemie sweater is a charity pattern, and is not intended to be used for items to be sold. The ‘price’ of use is to make and donate a sweater to a hospital near you. Pattern pdf is available here, and includes pattern for matching booties and hat. Please let me know if you find anything confusing, or any errors or omissions.